Today we are going to spend a few moments to think about John and his baptism and what that might have to say to us. 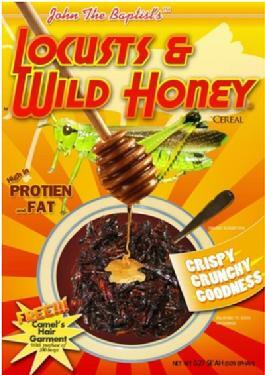 In the gospel lesson we read today, John the baptizer lives on a diet of locusts and wild honey. Yuck is usually my internal response. Locusts and honey. How strange. And that might be a clue. Where else do we see locusts? Hmmmm. Why would locusts show up as part of the John story? Seasons of the Spirit asks us, “What if the description of John’s diet is not just a literal statement about eating but also a figurative way of talking about his life?” In other words, he thrived (he “ate up”) in his work with both the “hard to love” (locusts) and the “easy to love” (honey)? Imagine, seventy young adults at a week-long orientation event before heading out to a year of service in various locations around the globe. They were participating in an exercise where the loudest voices in the room shouted words of discouragement and abandonment. (Let’s try that) Partners, on the other hand, acted as God’s voice (how do you think that sounded? What do you think they said?) and simply whispered encouragement and reassurance. Those participating found that, though it was just a whisper, the words of love, rang true, and the loudest voices faded and made no impression on the one to whom it was whispered. In our gospel lesson (Mark 1:4-11), we find God’s voice descending upon Christ with the familiar line, “This is my beloved.” Reassurance that we are loved with an authentic and compassionate love, shape and form us to go into this world to share those marks of God. But that voice can be rare for many of us. We are flooded with messages that tell us wealth or fitness or friends or popularity or that promotion or something else will set us on a new and better track. We forget that God’s proclamation of love is all Christ needs to then go into the wilderness (Mark 1:12–13) to face that same voice of temptation and to stare it down. God splits the heavens to be among us and repeatedly offers us the reminder that we are loved. This is the voice that sets us on a new beginning each and every day. This is the voice that gives us our worth and calls us to the work of justice in the world by facing down the voices of fear and hate. This is the voice whose whisper can drown out the loudest shouts of hatred and cruelty. So today, let us hear God’s whisper once again. Let us feel the waters of baptism, of new life, of love. One: The covenant of Baptism is a reminder to us of God’s grace. Within these cool waters, we dwell in God’s peace. All: Within these cool waters we dwell in God’s justice. One: Within these cool waters we are encompassed by God’s compassion. All: Within these cool waters we are encompassed by the Kin-dom. One: Within these cool waters we are marked as God’s beloved. All: Within these cool waters we are marked each day to follow in Christ’s footsteps. One: The baptismal waters are a place to play. It is here we remember that God lavishly splashes grace around this world. God fills our cups to overflowing. God submerges our sinful nature and declares us fit to live in love with God and one another. Come. Play. Remember your baptism. Remember God’s grace.